BAXTER—Would a united fund work better to attract companies and jobs to the lakes area? That was the opinion expressed by business leaders recently during a Baxter City Council work session. 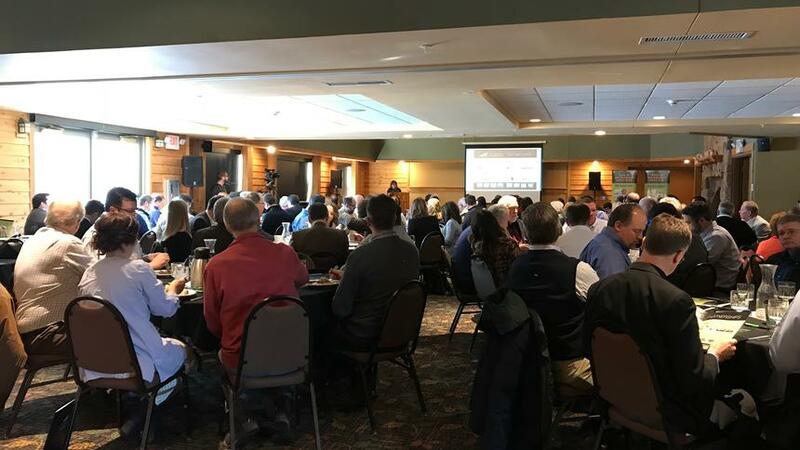 Sheila Haverkamp, executive director of the Brainerd Lakes Area Economic Development Corp., noted over the years BLAEDC has acted as a technical partner for fund programs. She said about a dozen various municipalities have pools of money establishing local revolving loan funds. Revolving loan funds can be an important link for businesses looking for gap funding as they work with lenders for projects. Haverkamp suggested a better model would be to locate those funds into a single-stop experience and move forward with a united fund to make it easier to use the funds in the lakes area. The idea has been discussed for some time, she said. “We’ve decided the time is now to try to move forward and create this unified fund,” Haverkamp said of the effort to streamline and make it easier for companies to access the pools of money. She noted Baxter was a beneficiary of a federal fund some years ago used by Team Industries and as the company paid it back, the revolving loan fund was established. Stakeholder meetings are getting the word out as BLAEDC tries to gain feedback and support for the idea. Meetings are continuing this month and into October, looking specifically at Brainerd, Baxter and Crow Wing County to consider the option. A public hearing would be required before action to adopt such an agreement. With a unified fund, the city of Baxter would have a seat on the united fund board that would make loan decisions, with loans of $300,000 or more going to BLAEDC to put another set of eyes on the loan transaction for a project of that size. Haverkamp said they are optimistic and hopeful about a unified fund. 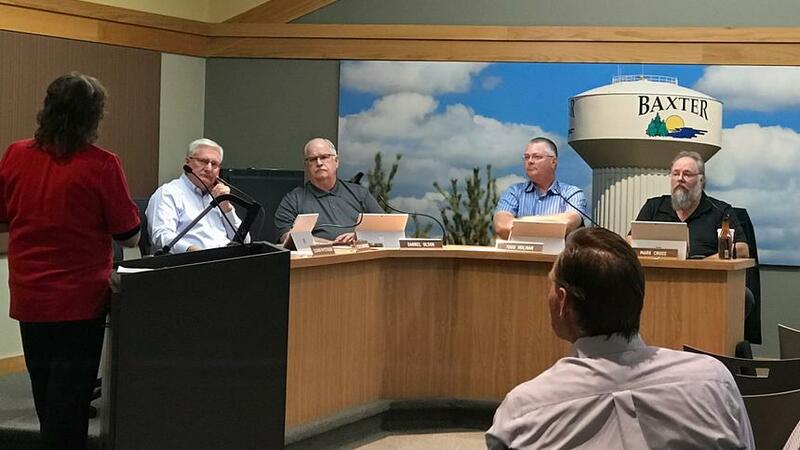 She said a couple of entities are on board and utilizing the united fund process in Crow Wing Power and Consolidated Telecommunications Co. Haverkamp said the city of Crosslake allocated its money to Crow Wing Power. 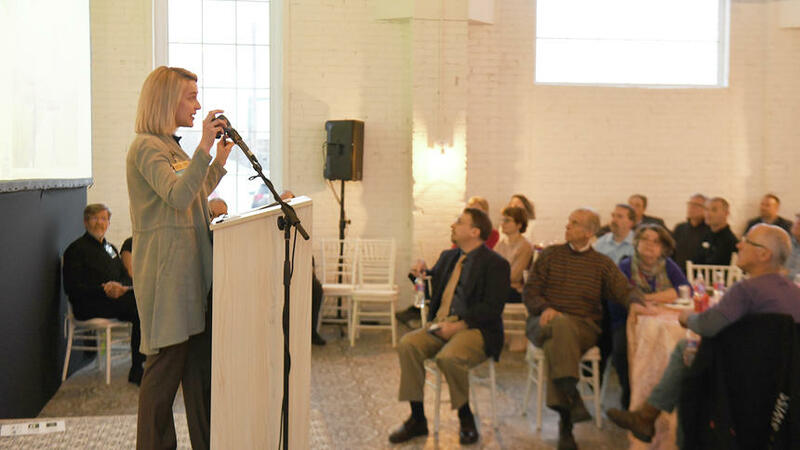 Accompanying Haverkamp were local industry leaders, including executives Tom Haglin, LINDAR owner, and Jerry Sinner, president/CFO at Stern Companies. Haglin said having BLAEDC support looks good to lenders and it is daunting to have all the various entities and various processes to go through to reach the individual funds. “Could you repeat that,” Mayor Darrel Olson said, getting laughs from the audience. Haglin said Haverkamp is a dreamer and always has plans. He said he met with BLAEDC last week saying he was looking at two projects and right away the wheels were turning and looking at options. Sinner, an executive with Stern companies, is also on the Brainerd Economic Development Board. He said they met recently to discuss the issue and there was some resistance on the Brainerd side, too. Between entities like Crow Wing County and from the Baxter perspective, Sinner said there is an argument that the individual areas want that money and want to use it as their leverage for a business location. Sinner stated a business coming in is looking at location that has what they need in infrastructure, buildings, the site, access to the rail line and people. Funding, he said, is not usually the first thing. Those are going to be the key things Sinner said he is looking at first, and then he’s going to proceed to where he can get access to the dollars. “We all benefit if we get somebody into the county, and I would say Baxter even more than most because of your retail side,” Sinner said. He added even though these dollars don’t go directly toward Baxter retail growth, attracting and supporting new businesses within the county may mean Baxter’s gain in residents living in the city’s neighborhoods. Sinner said creating a bigger fund can bring bigger companies in which can hire more people and draw with just the power of a big name. Certainly the application process is cumbersome the way it is today, Sinner said. 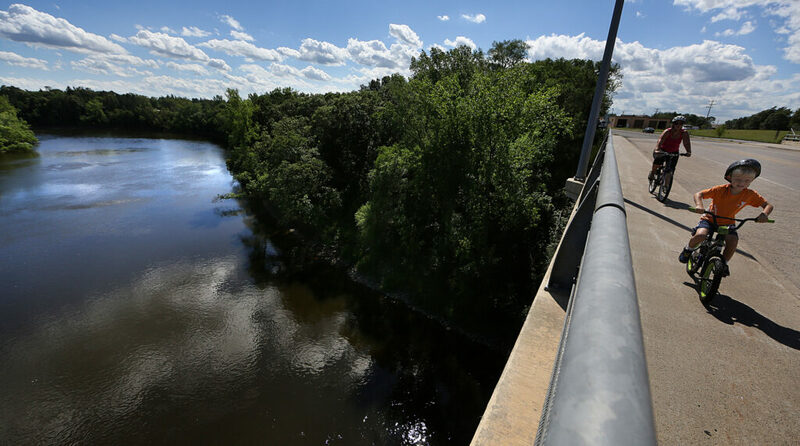 He said they were successful doing a project in Brainerd where they did pull in Brainerd, Region Five, the Initiative Foundation and one of the regional banks, but it was a lot of work. If everyone is involved, Sinner noted the unified fun could involve $4 million. Baxter’s revolving loan fund came from federal dollars but with restrictions and after the initial loan the money could go to a de-federalized process making it easier to work with companies in the future. A nonprofit, BLAEDC works with business startups, aiding companies looking to expand, attracting new companies to the lakes area, supporting development and redevelopment. The unified fund would look at minimum loans of $25,000 and maximum loans of $500,000. Participating companies would need to provide a business plan and financial projections along with information on cash flow, profit and loss and tax returns among other documents. Haverkamp provided ballpark numbers for the funds BLAEDC is talking about, including $700,000 from Crow Wing Power, $300,000 from CTC, Brainerd with $500,000 in a federal pool of money and $150,000 from a state pool of money in cash and receivables, Lake Edward $100,000, Crow Wing County $100,000 and Deerwood $400,000. Crow Wing County EDA also has funding, as well as Baxter. “We are hopeful you will consider it,” Haverkamp said. Baxter City Council member Todd Holman asked what criteria would be used or how projects would be ranked when they are seeking the funds. Haverkamp said typically they do not have a number of projects in front of a loan committee each month and may see one or two loans coming though if a bank is willing to participate. They look at equity and what is the remaining financial need. And Haverkamp said they can apply for new grants as well because what they are hearing now are questions on what the lakes area is doing with its existing pools of money to get them out and used as intended. The plan is for a shorter term for gap lending to allow the fund to recoup the investment. Olson asked about riskier ventures and the potential to recoup money if a business fails. The answer was that is a potential and the unified fund would follow the bank’s lead, which typically means a liquidation of assets and if there are excess dollars the fund could be reimbursed. But some loans that go bad have to be written off, which is why the upfront due diligence is so important. With a loan package, the borrower with a $100,000 loan would pay a 4 percent annual interest and $1,500 at closing as an origination fee. The fee would be divided equally between BLAEDC and the Initiative Foundation. Haverkamp said this isn’t a financial generator for BLAEDC and there are significant costs with legal fees and underwriting to get this going, but they felt it was the right direction for the community and the businesses. BLAEDC will provide annual reports. The legal process requires a public hearing and then if the city agrees it would go to the state for final authorization. Olson said he was impressed with the detail and it was well laid out. It was just a matter of whether the city wanted to jump in or not, he said. Paul Means, RiverWood Bank chairman, noted the reason the funds are so high at $4 million is because they have been underutilized. The lakes area is competing for business with other communities that have already taken the step to provide a unified fund to better attract or assist businesses. What’s next for Brainerd revitalization efforts?